How cold was it over the Christmas period? In Ireland the weather is always one of the most common topics of conversation. However, this Christmas period people were spending even more time than normal speaking about the weather because of the fact that we had a white Christmas which is quite unusual for us. The weather in Ireland is very localized so people are constantly asking each other "what is the weather like where you live" because the weather can be very different just a few miles away. By lucky co-incidence Santa brought be a weather monitoring station (I must have been very good this year). I only assembled it around mid-day on Christmas and today I tried uploading some of the data from it. 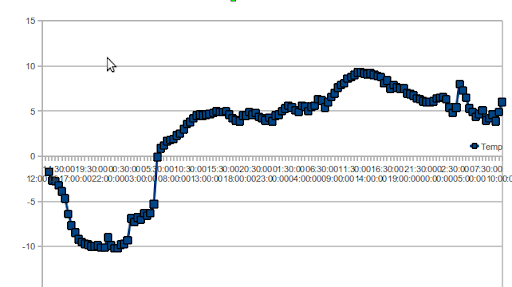 As you can see from this chart the temperature was slightly below zero when I installed int and dropped sharply as night fell, but then the thaw started. Christmas is a time for traditions so it is fun to consider how the nativity story could have been different if they had the Internet back then. This video does that. I hope you enjoy it. Not surprisingly I found this video when a friend shared it on Facebook. Why can't Dublin Bikes facilitate casual use by tourists? As many of you know I am a keen cyclist. Because, I have my own bike. I don't have a lot of cause to use the Dublin Bikes rental scheme, but I have been very impressed with the scheme whenever I do have a cause to use it. The only gripe I have about the system is that it is cumbersome to sign up and it typically takes several days to get a membership card. Unfortunately this means that the scheme can't be used by tourists visiting Dublin. There is a similar scheme in many other cities. I see that the London cycle system recently added a facility for casual users to rent a bike without having to have an annual subscription. I wonder why Dublin bikes don't introduce a similar facility? I am sure tourists would love to use it to cycle around the city centre. If you are like me you have probably carelessly subscribed to several mailing lists and you find the regular emails from these merchants to be vaguely annoying. Most of these maliing lists would probably remove you from their mailing list if you took the trouble to follow their process for unsubscribing. However, this can be a lot of trouble and there is always the risk that the senders are unethical hackers and will treat your click on their unsubscribe link as encouragement to send you more annoying emails. Luckily there is a service called unsubscribe.com which will look after the unsubscription for you. After you register, you can either use their unsubscribe buttons (they have buttons for all of the major public email providers) or else you can simply forward any emails from the mailing list to mail@unsubscribe.com - they have software which can recognize which email list has sent the promotional email to you and they will initiate a removal request on your behalf. They have a free account which will unregister you from a maximum of 5 lists per week. If you want more you can purchase a paid subscription, but I generally find that 5 per week is enough for me. I must admit to being somewhat skeptical of the scientists who continue to warn us that the global climate is definitely warming up rapidly due to the effects of human activity. While I do accept that human activity may be having an effect upon climate, it is hard to believe the confident predictions for what the weather will be like in 20-50 years from a profession that routinely fails to accurately predict what the weather will be like tomorrow. Of course my skepticism may be influenced by the fact that I live in a country where the weather is notoriously unpredictable. This probably also explains why weather is a constant topic of conversation in Ireland. A colleague from Egypt once told me that Egyptians rarely speak about the weather, because for them it is a boring subject for conversation (pretty much every day is hot and dry). The last week or so has seen the temperatures in Ireland reach a record low for the month of November. As you can see from this picture taken out my back garden, we also got quite a significant covering of snow. While this naturally caused some disruption, I am glad to report that life and business has not come to a complete halt. The children of course are delighted with this rare chance to build snowmen and play snowballs.